Knoco stories: How to destroy the copmplacency behind "not invented here"
How to destroy the copmplacency behind "not invented here"
"Not invented here" is a huge barrier in Knowledge Management, but there are two ways to overcome it. 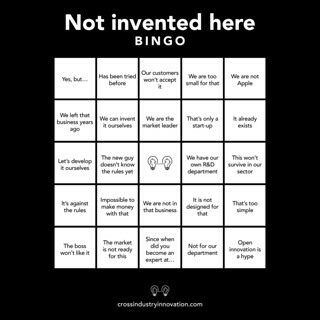 "Not Invented Here" is a form of complacency. It is the feeling that "my knowledge is good enough", which then drives behaviours of failing to listen to others, failing to look for ideas and knowledge from others, and failing to learn from others. When people are unwilling to listen and learn, then knowledge management is stifled. However there are two ways to shake people out of this complacency. You can outlaw "not invented here"
Management can refuse to sanction any idea, project or investment which has been "invented here." As an example, BP Exploration would not sanction any project if it had not held a Peer Assist to bring in knowledge from other parts of the organisation. They are now taking this further, by verifying that the knowledge shared at the peer assist is been acted upon. These are two examples where "not invented here" behaviours have unacceptable consequences; failing to acquire funding, and looking stupid in front of the manager. You can shock people by the realisation that their knowledge is not good enough. Recently we received some interesting feedback from our “Bird Island” exercises, where somehow "Not Invented Here" is never an issue. “The big learning for me” this guy said “was the shock when I saw what others had done, and how poor our performance was compared to theirs”. In this exercise, we ask teams to perform a task in isolation – to build a tower as high as they can, which can also pass certain constraints (so trading off height versus stability). We then allow the teams to share knowledge with each other, and we then show them the best practice from all the (nearly 300) teams who have done the exercise before. There are three moments when team members get an emotional shock. Firstly when a team, who is proud of their 80cm tower and think they could stretch to 95cm with luck, are visited by someone from a team who have already reached 125cm. You can see the jaws drop as they realise how constrained their thinking has been. Secondly when we show the teams the benchmark statistics (current record height, well over 3m, current modal height, 290cm). There is always an audible gasp in the room, as teams who think they might just about get to 150cm, realise how far off the mark they really are.